Google or the Google Founders are making well funded attempts to conquer big technological challenges. Success in these major endeavors will alter the trajectory of the future of humanity. Google just has not gotten into radical transformation of transportation other than robotic cars. Elon Musk has transportation covered with Spacex reusable rockets and Tesla electric cars. Elon will also likely get into supersonic electric passenger jets and Hyperloop. I expect Google or its founders will get involved in molecular nanotechnology at some point. I did see Sergey Brin and Larry Page at a Foresight molecular nanotechnology conference in the very early days of Google. Here is the list of technologies and technological challenges which Google or the Google Founders are taking on now. Google has acquired seven robotics and artificial intelligence companies and is funding a major "moonshot" to create radical capability with robotics. Google has spunoff Calico, a company focused on achieving antiaging breakthroughs. Radical life extension via the new startup Calico. Even the announcement has brought more legitimacy to radical life extension. Aubrey de Grey of SENS (Strategies for Engineered Negligible Senescence – repairing the damage of aging) has indicated that it will make his fund raising efforts easier. Art Levinson, x-CEO of Genentech is leading Calico. 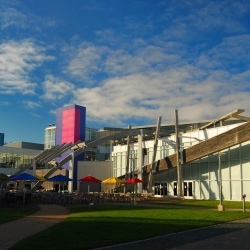 Genentech was bought by Roche for $47 billion in 2009. Biotech and pharma companies will take notice of goals laid out by Calico. Google made robotic cars legitimate. There was already the University research and the DARPA challenge, but robotic cars were not being seriously pursued by any car company. Anyone might talk about self driving cars but they would be targeting 20 years away, which would basically be never. They would be car show demos forever. Tesla is now pushing for 90% self driving cars within three years. States and countries are making them legal and are working out the regulations. Mostly self driving cars within 5 years only happens because Google made serious efforts to push it into reality and commercialization. Just in the U.S., self driving cars can generate $2 trillion a year in revenue and even more market cap.